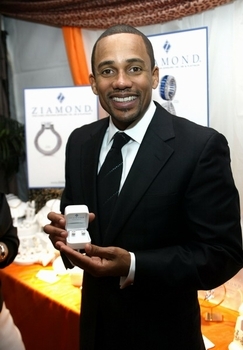 Hill Harper, from the hit TV show CSI New York, proudly displays his pair of 14k white gold stud earrings. Ziamond's high quality cubic zirconia cz Stud Earring Collection features the finest quality cubic zirconia available. All Ziamond Cubic Zirconia CZ jewelry is set in 14k gold, 18k gold or platinum.